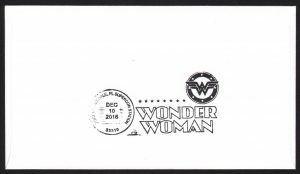 This postage stamp and envelop First Day of Issue cancellation (FDI) was released by the United States Postal Service in honor of Wonder Woman’s 75th anniversary. Four stamps were released in all, and this stamp features the artwork of Irving Novick and depicts Wonder Woman during the Silver Age of Comics. Best of all, this particularx FDI stamp envelope is signed by hand by 19 comic creators who have either written or illustrated Princess Diana for DC Comics over the course of her 75+ year career. It is also double cancelled with the special cancellation stamp from the Ft. Lauderdale’s Paradise City Comic Con special event honoring Wonder Woman’s 75th anniversary. 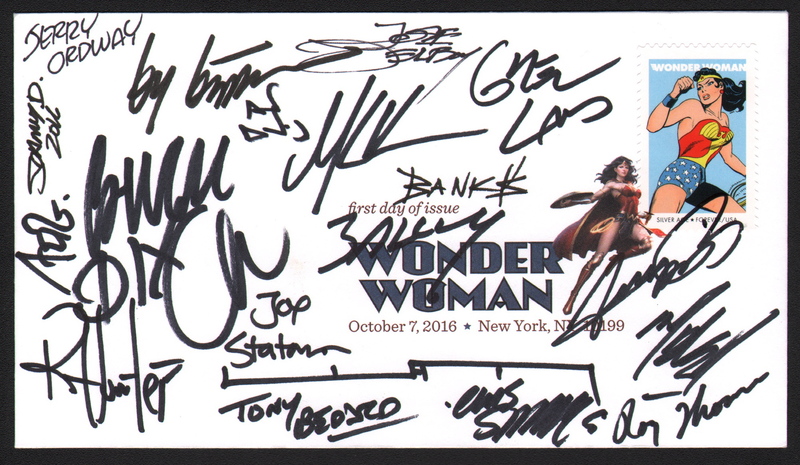 The signatures include the greatest Wonder Woman artist of all, George Perez, as well as veteran comic legends Jerry Ordway, Alan Davis, Jose Delbo, Joe Staton, Mark Bailey, and Roy Thomas. 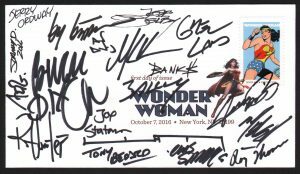 Additionally, the FDI is signed by modern age comic creators who have worked on Wonder Woman, including Ty Templeton, Liam Sharp, Matthew Clark, Matt Haley, Chuck Dixon, Rob Hunter, Greg Land, Tony Bedard, Chris Sprouse, Darryl Banks, and Johnny DesJardins. Lastly, the stamp is also cancelled by superstar artist Stanley “Artgerm” Lau (the figure of Wonder Woman used to cancel the stamp – the one holding the sword and shield on the envelope – is Lau’s artwork). Please note- the signatures are all real. They are the actual, hand-signed signature of the comic creators stated. They are not pre-printed images on the FDI’s. Please see below for important information about the availability of COA’s. Signatures may vary slightly as to exact location signed but are clear, not smudged, etc.